Rostov is a town in Yaroslavl Oblast, Russia, one of the oldest in the country and a tourist center of the Golden Ring. Kick off your visit on the 13th (Tue): take in the architecture and atmosphere at Church of the Resurrection of Christ. To see reviews, photos, and more tourist information, go to the Rostov trip builder. Singapore, Singapore to Rostov is an approximately 22-hour combination of car and flight. The time zone difference moving from Singapore Time to Moscow Standard Time is minus 5 hours. While traveling from Singapore, expect little chillier days and much colder nights in Rostov, ranging from highs of 25°C to lows of 16°C. Finish your sightseeing early on the 15th (Thu) so you can drive to Arkhangelsk. Arkhangelsk, also known in English as Archangel and Archangelsk, is a city and the administrative center of Arkhangelsk Oblast, in the north of European Russia. Eschew the tourist crowds and head to Space Station Orbita and Church in Honor of Vladinir Icon of Our Lady. Change things up with these side-trips from Arkhangelsk: Severodvinsk (Church in Honor of St. Nicholas & The Memorable Sign to Richard Chensleru). There's still lots to do: make a trip to Dormition of the Mother of God, appreciate the history behind Monument Plane Il-14, pause for some serene contemplation at Holy Trinity Church, and steep yourself in history at E. Plotnikova's Estate Museum. To find more things to do, ratings, and tourist information, read our Arkhangelsk itinerary builder. You can drive from Rostov to Arkhangelsk in 10.5 hours. Another option is to do a combination of car and flight. Plan for little chillier temperatures traveling from Rostov in June, with highs in Arkhangelsk at 20°C and lows at 9°C. On the 18th (Sun), wrap the sightseeing up by early afternoon so you can drive to Naryan-Mar. Kick off your visit on the 19th (Mon): get a new perspective on nature at Pustozersk Museum of Natural History, pause for some serene contemplation at Epiphany Cathedral, make a trip to Monument to Feat of Deer-Transport Battalion Participants During Great Patriotic War, then appreciate the history behind Monument to Participants of Local Wars and Armed Conflicts, and finally make a trip to Building of Nenets Autonomous Okrug Administration. For reviews, photos, ratings, and other tourist information, use the Naryan-Mar vacation planner. Getting from Arkhangelsk to Naryan-Mar by car takes about 8 hours. Other options: do a combination of car and flight. Finish your sightseeing early on the 20th (Tue) so you can travel to Veliky Novgorod. An ancient city thriving as a modern tourist destination, Veliky Novgorod rightly bills itself as the birthplace of Russia. Explore hidden gems such as Church of George Victorious and St. Sophia Cathedral. Get out of town with these interesting Veliky Novgorod side-trips: Staraya Russa (Dostoyevskiy Statue & Holy Trinity Church). There's still lots to do: pause for some photo ops at Millennium of Russia, pause for some serene contemplation at Church of St. Philip the Apostle and St. Nicholas, appreciate the extensive heritage of Novgorod Kremlin (Detinets), and see the interesting displays at Vitoslavitsy Museum of Folk Wooden Architecture. For reviews, maps, more things to do, and other tourist information, you can read our Veliky Novgorod trip itinerary maker. You can do a combination of car and flight from Naryan-Mar to Veliky Novgorod in 13.5 hours. Finish up your sightseeing early on the 24th (Sat) so you can go by car to Pskov. Pskov is a city and the administrative center of Pskov Oblast, Russia, located about 20km east from the Estonian border, on the Velikaya River. 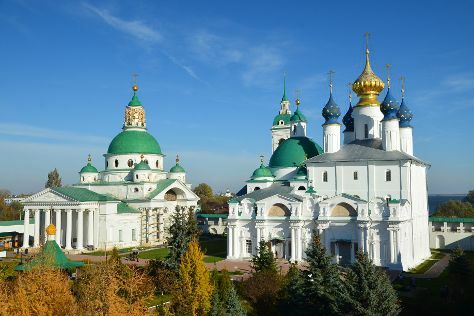 You'll discover tucked-away gems like Pskov Kreml/ Krom and The Holy Dormition Pskovo-Pechersky Monastery. Venture out of the city with trips to Izborsk (Izborsk State Museum Preserve & Izborsk Fortress) and Ostrov Museum of Local Lore (in Ostrov). There's much more to do: take an in-depth tour of Memorial Estate of Mussorgsky M. P., pause for some serene contemplation at Pokrova and Rozhdestva ot Proloma Church, pause for some photo ops at Two Captains Monument, and make a trip to Temple of Elijah. To find maps, other places to visit, reviews, and other tourist information, refer to the Pskov vacation builder. Traveling by car from Veliky Novgorod to Pskov takes 3.5 hours. In June, daily temperatures in Pskov can reach 24°C, while at night they dip to 14°C. Cap off your sightseeing on the 28th (Wed) early enough to go by car to St. Petersburg. 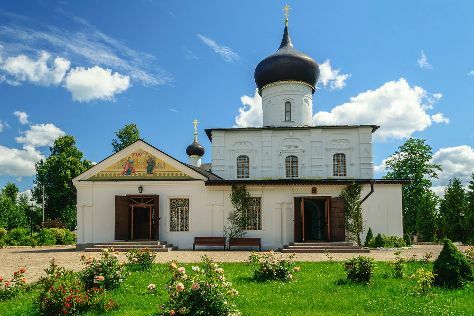 Izborsk, The Holy Dormition Pskovo-Pechersky Monastery, Ostrov Museum of Local Lore, Memorial Estate of Mussorgsky M. P.
Eschew the tourist crowds and head to Grand Palace and Catherine Palace and Park. Step out of St. Petersburg to go to Kobona and see Road of Life, which is approximately 1:20 hours away. And it doesn't end there: see the interesting displays at State Hermitage Museum and Winter Palace, explore the stunning scenery at Canyon of River Lava, pause for some serene contemplation at St. Isaac's Cathedral State Museum-Memorial, and steep yourself in history at Palace Square (Dvortsovaya Ploshchad). To see maps, more things to do, ratings, and other tourist information, go to the St. Petersburg sightseeing planner. Traveling by car from Pskov to St. Petersburg takes 4.5 hours. In June, plan for daily highs up to 24°C, and evening lows to 13°C. Finish up your sightseeing early on the 1st (Sat) so you can travel to Yakutsk. Yakutsk is the capital city of the Sakha Republic, Russia, located about 450km south of the Arctic Circle. You'll explore the less-touristy side of things at Kangalasskiy Cape and Temple of the Nativity of the Holy Virgin. There's still lots to do: get outside with Lenskiy Pillars/ Lenskie Stolby, appreciate the history behind Monument to Petr Beketov, examine the collection at Museum and Center of The Khomus of The People of The World, and make a trip to Treasury of The Republic of Sakha (Yakutia) Exhibition. To see where to stay, other places to visit, maps, and other tourist information, you can read our Yakutsk itinerary maker. Traveling by combination of car and flight from St. Petersburg to Yakutsk takes 9 hours. The time zone changes from Moscow Standard Time to Yakutsk Time, which is usually a 6 hour difference. In July, plan for daily highs up to 29°C, and evening lows to 15°C. Finish your sightseeing early on the 4th (Tue) to allow enough time to travel back home.